The Seder plate. The garnished dinner table. Someone is hiding the afikoman for the little ones to find later. The matzah ball soup simmers in the background. It’s time for Passover, a Jewish holiday centered on the Jews’ exodus from the Egyptian pharaoh. Passover is actually one of those holidays in which the wine takes a dominant role. Wine is consumed throughout the entire Seder. Of course, this indicates that wine selection should be considered and planned much like the meals to sustain the entire holiday. However, the world of Kosher wines – and their quality – remains somewhat a mystery beyond the reliable bottle of Manischewitz. Below are three dry (as in, not sweet) Kosher wine brands that have previously adorned the Passover table, and many found delightful. Note: If your relatives prefer sweet, provide them with a sweet alternative or honey/sugar to mix into their wine. This concentrated dry, red wine is a blend of 74% Cabernet and 25% Barbera. It is a Mevushal wine, produced in Israel and is certified Kosher for Passover. It is full bodied and contains quite a bit of toastiness from the oak. Some vintages may experience a touch of green bell pepper, but it is usually quite challenging to find. Depending on where you live, this will retail for about $25 per bottle. If you would like more information on this wine, please refer to this website here (although it can be purchased through a number of wine retailers). This has been one of my favorite Kosher finds as it is delightfully aromatic with vibrant tropical fruit, zesty, candied orange slices, and fresh floral flavors. I recommend starting the Seder with this wine, as it will surely get everyone in the mood for a night of family and remembrance. This is a Mevushal, dry white wine produced in Chile, and it usually retails at $10 or less. It’s a bargain! The Casa de Cielo is Kosher for Passover. If you would like more information on this wine, please refer to this website here or here (although it can be purchased through a number of wine retailers). If you would like a change from the Mevushal-produced fruit bombs, the Yogev dry, red blend offers a more masculine style of wine. It is Kosher for Passover, but not produced under Mevushal production rules. Yogev is made in Israel and retails for about $15 per bottle. It had red fruit flavors coupled with dried herbs flavors that reminded me a lot of Old World style red wines. Very soft mouthfeel and will pair very well with the various foods associated with the Passover Seder. You can find more information about this wine here (although it can be purchased through a number of wine retailers). Need a fun appetizer for Passover? Spread Kosher for Passover cream cheese over large pieces of smoked salmon. Cut the salmon into thin slices and roll up. 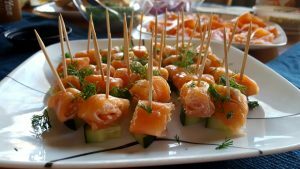 Using a toothpick, secure the salmon rolls and add a small piece of cucumber beneath it. Sprinkle with fresh dill or capers. Wa-la! Also, if you missed my previous post about picking wines for a wedding ceremony, one of my favorite non-Mevushal producers is Galil Mountain Winery. These wines are also Kosher for Passover, but I really love this wine for personal moments like a wedding ceremony.